November monthly data reported this past week included improving retail sales, advancing industrial production and capacity utilization (although October was revised downward), and decreases in both producer and consumer prices. In the rear view mirror, October manufacturing and trade sales came in poor. 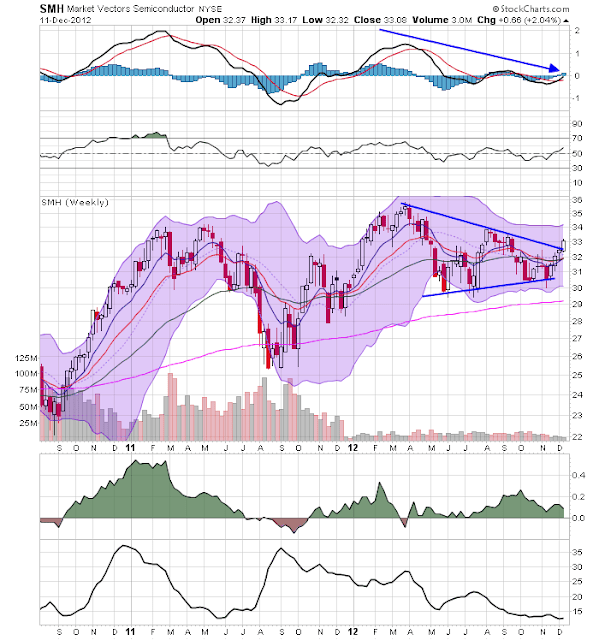 A reminder that I watch the high frequency weekly indicators because even though they are more noisy, they will signal a turn or continuation in the direction of the economy well before monthly data is reported. In particular, right now November monthly data is still affected by Hurricane Sandy, while its affect the weekly data has almost completely abated. The Department of Labor reported that Initial jobless claims fell from 370,000 to 343,000. This is only 1000 higher than the lowest weekly report since the onset of the recession at the end of 2007. The four week average fell by 26,250 to 381,500. As of one week ago, the effects of Hurricane Sandy were still slightly affecting the weekly number. As the elevated post-Sandy numbers wash out, the 4 week average should continue to decline for the next several weeks. The American Staffing Association Index increased from 91 to 94. This is normal post-Thanksgiving week rebound. The general trend in this index remains similar to last year. The Daily Treasury Statement showed that for the first 9 days of December, $68.1 B was collected vs. $61.2 B for the first 9 days of December last year. For the last 20 days ending on Thursday, $145.4 B was collected vs. $128.3 B for the comparable period in 2011, an increase of $17.1 B or +13%. Tax collections have continued to increase sharply for over a month. The ICSC reported that same store sales for the week ending December 7 declined -0.7% w/w but were up +3.2% YoY. Johnson Redbook showed a 2.2% YoY gain. Johnson Redbook has consistently been lower than the other series for consumer spending, usually running under 2% YoY so this is relatively positive. The 14 day average of Gallup daily consumer spending as of December 13 was $82, compared with $74 for this week last year. Earlier this week we had the highest 14 day average since November 2008, at $89. Weekly BAA commercial bond yields rose +.01% this week at 4.57%. 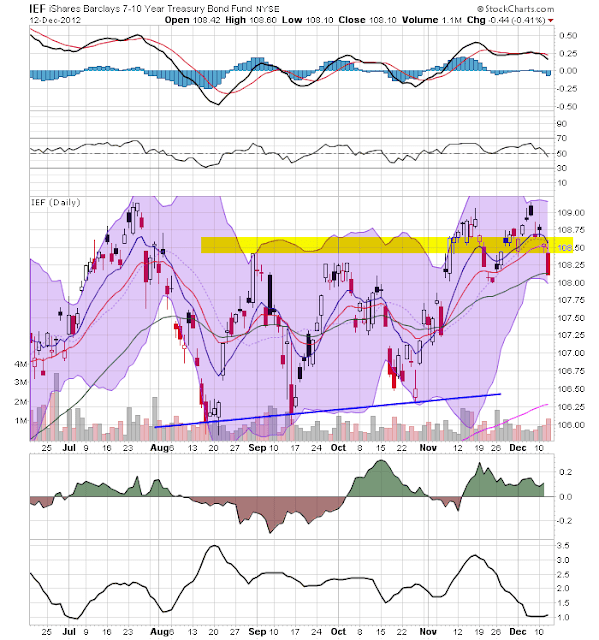 Yields on 10 year treasury bonds however fell -.01% to 1.62%. The credit spread between the two likewise increased by .02% to 2.95%. Spreads have increased in the last few weeks, but remain well off their 52 week highs. The Mortgage Bankers' Association reported that the seasonally adjusted Purchase Index rose 1% from the prior week, and also increased 9% YoY, close to if not at a 2 year high. The Refinance Index increased 8% for the week, and continues to be close to its recent multi-year highs. The Federal Reserve Bank's weekly H8 report of real estate loans this week declined -21 w/w to 3523. The YoY comparison also decreased to +1.1% and is 1.4% above its bottom. YoY weekly median asking house prices from 54 metropolitan areas at Housing Tracker increased +2.4% from a year ago. YoY asking prices have been positive for over an entire year. M1 rose +0.1% for the week, and also increased +2.0% month over month. Its YoY growth rate rose to +13.8%. Real M1 also rose to +12.0% YoY. 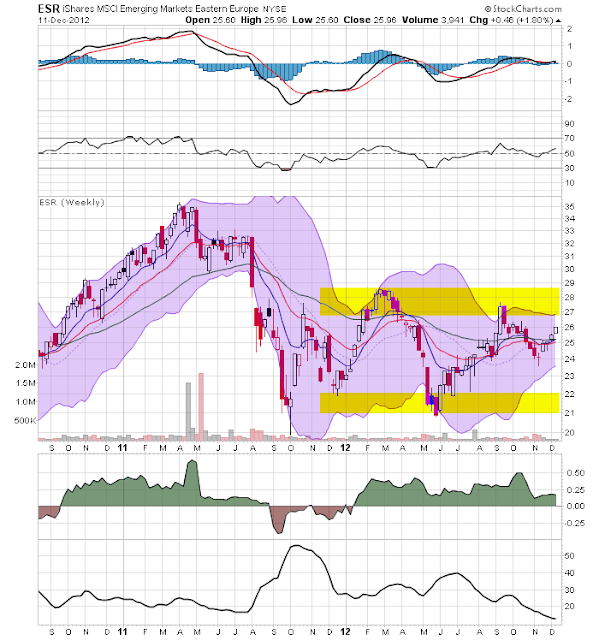 M2 increased +0.3% for the week, and was up +0.1% month over month. Its YoY growth rate rose to 7.4%, so Real M2 rebounded to 5.6%. The growth rate for real money supply has declined significantly in recent months, but is still quite positive. The American Association of Railroads reported that total rail traffic was down -5700 carloads YoY, or -1.0%. Non-intermodal rail carloads were again off considerably less than in recent weeks, only -4900 or -1.6%, and as usual entirely due to coal hauling, which was off -13,000. Ex-coal carloads were up 7300. Negative comparisons rose from 6 back to 8. For the second week in a row, however, intermodal traffic was actually down -800 or -0.3% YoY. Gasoline prices fell $.04 last week to $3.35. This is still higher than last year at this time. Oil prices per barrel increased from $85.93 to $86.73. Gasoline usage was down for one week at 8488 M gallons vs. 8666 M a year ago, or -2.1%. The 4 week average at 8542 M vs. 8650 M one year ago, was off -1.2% YoY. 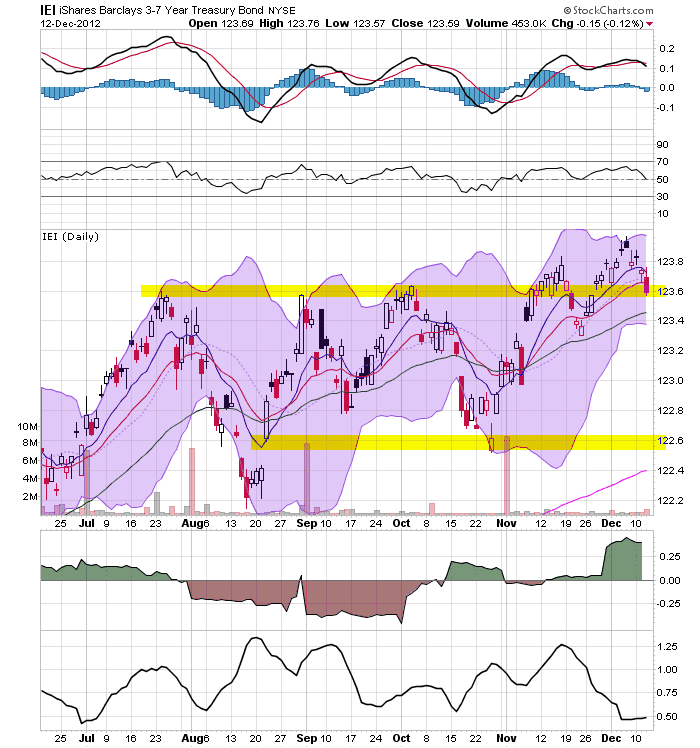 The TED spread rose from 0.23 to 0.29, a 3 month high, and in the middle of its 3 year range. The one month LIBOR fell from 0.2120 to 0.2090, near its 3 year low. The Baltic Dry Index fell sharply from 966 to 784, a 2 month low, but still within the middle of its 1 year range. The Harpex Shipping Index also fell 7 more to yet another new 52 week low of 353. 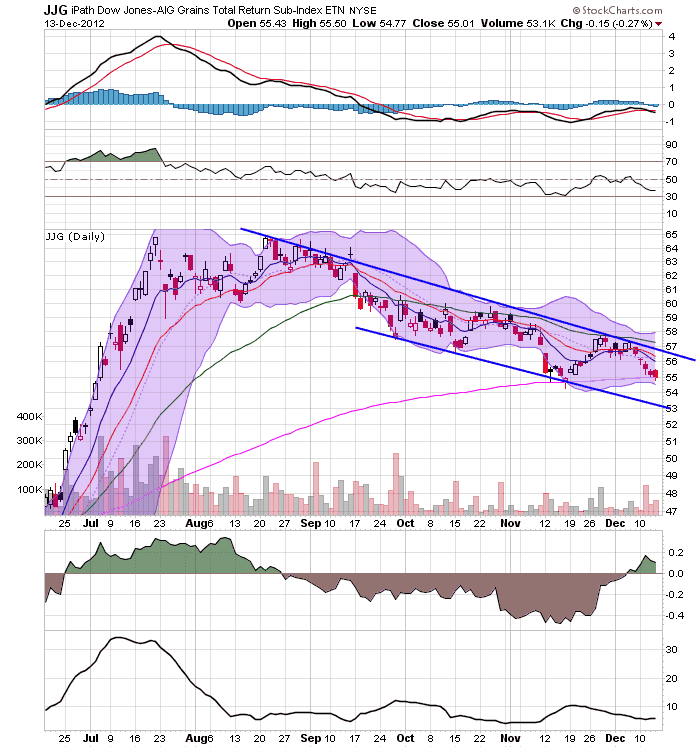 The longer term declining trend in shipping rates for the last 3 years is intact. Finally, the JoC ECRI industrial commodities index rose from 122.24 to 123.20. It continues to be positive YoY, up 4.85. Once again the old-fashioned type of economy is producing weak or contractionary data. This includes shipping, rail traffic, and gasoline usage. On the other hand, domestic rail ex-coal is positive and improving. 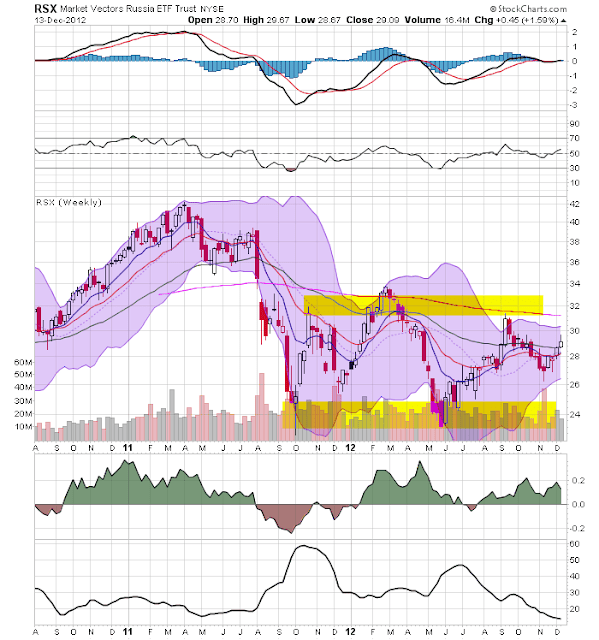 Housing continues its resurgeance from a very low level. Consumer spending is getting even stronger. Weekly employment data is very positive. Gas prices are accomodative for now. One new small negative is that bank lending rates and bond rates and spreads have turned up slightly. Money supply, however, remains quite positive. In general the leading data remains positive, while the coincident data is mixed. The economy is shambling along, with what still appears to be a lukewarm positive bias. The economy lurched forward in November, more than making up for the downturn in October. At this point we have 3 of the 4 coincident indicators most generally presumed to be used by the NBER in dating economic peaks and troughs. We already knew that employment rose. Additionally, it is thought that some weight is placed on aggregate hours worked, and those also rose. Today we found out real retail sales and industrial production, and both of those rose as well. ECRI appears to rely upon a different sales metric, inflation-adjusted manufacturing and trade sales. Those were just reported as declining in October, so we have no apples-to-apples November comparison. Wage-earners are still losing ground, although at a less-bad rate, only -0.5% YoY in November. Industrial production has been basically flat since March, the same month that employment growth, while still positive, ratcheted down. Real retail sales are improving again, although real manufacturing and trade sales are flat. Depending on the area of emphasis, the US economy is either slightly expanding or slightly contracting -- i.e., still shambling along. I wrote this story last weekend. Since then, Markit and the ECB have released additional information to that provided in this post. However, nothing released has changed the overall tenor of the economic situation. 1.) 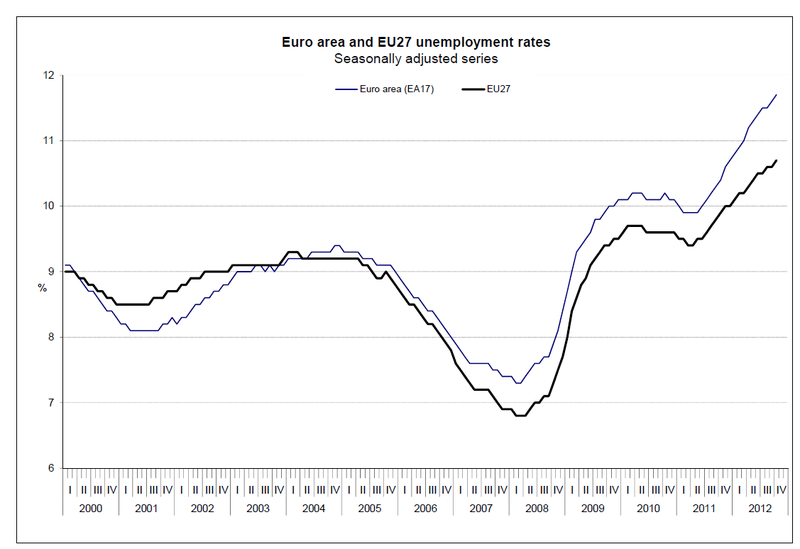 The EU 17 has been contracting for three straight quarters. 2.) The EU 27 has bee contracting for two straight quarters. In other words, the entire continent can be described as in a recession according to one of the standard definitions of recession (two straight quarters of contraction). 3.) 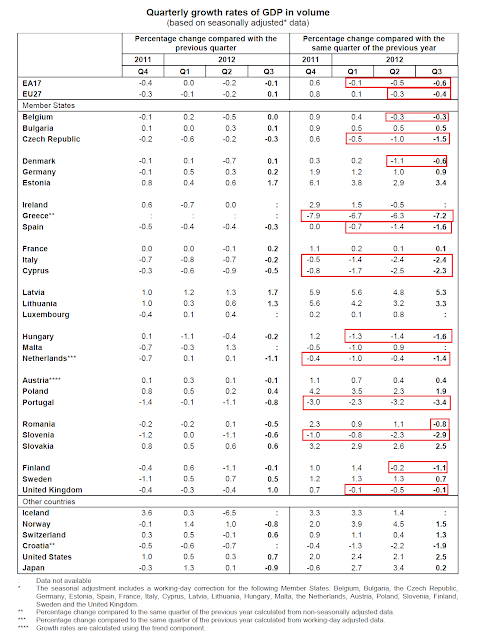 Six countries have been contracting for at least four quarters: Italy, Greece, Cyprus, Portugal, Netherlands and Slovenia. That means that of 27 countries in the EU 27, a little under half are in a technical recession. When we look at the contributions from household spending and investment to EU growth, we see that household spending contracted in 6 of the last 8 quarters for the EU17 and 27 and only barely grew for the EU 27 in the 3Q12. Total investment has contracted for four straight quarters as well. In short, two key components of GDP have shown no meaningful growth in a year. The above is from the ECB's latest chart pack and shows that the only GDP element keeping the region out of trouble is net exports. July, it was nonetheless indicative of a solid contraction in overall private sector output. The average reading so far in Q4 is the weakest since the second quarter of 2009. 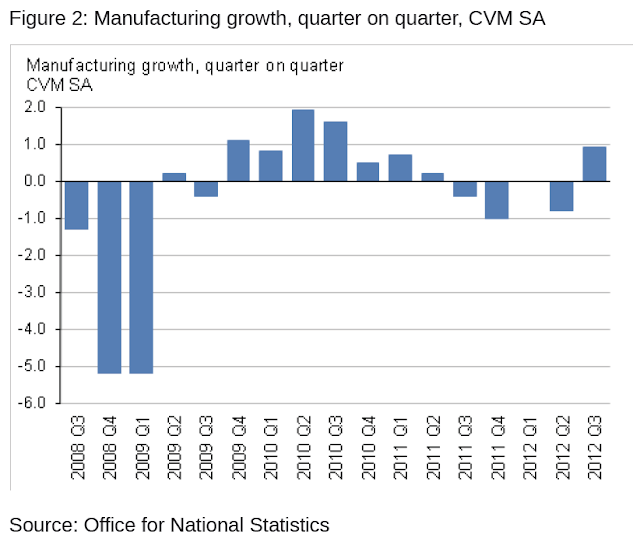 Downturns continued in both the manufacturing and service sectors in November. However, rates of contraction slowed to seven- and three-month lows respectively. Both sectors were affected by weak demand from domestic and export markets. The left chart above shows that industrial production growth has been negative or just barely growing for most IP sectors over the last year. The key element of the chart on the right is that incredibly sharp drop in industrial confidence (the dotted red line), which is now dropping at levels last seen in the great recession. And the above chart shows that retail sales have been contracting for over a year and a half. As a result, consumer confidence has been dropping for the same time as has retail confidence. 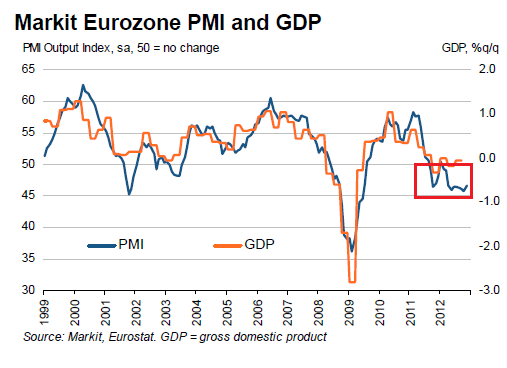 Like the Japanese and UK economies presented earlier this week, the EU economy is in terrible shape. 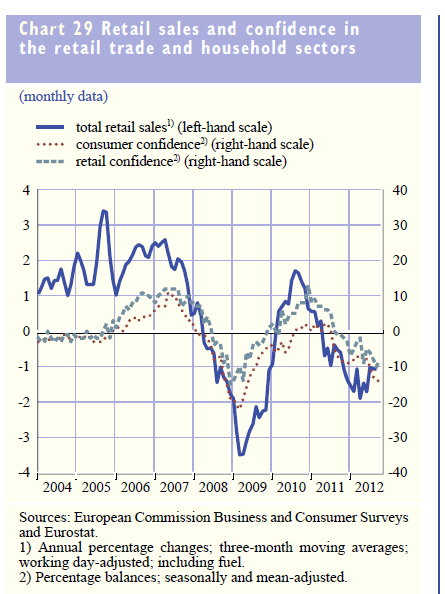 It's in a continent wide recession; retail sales as is industrial production. 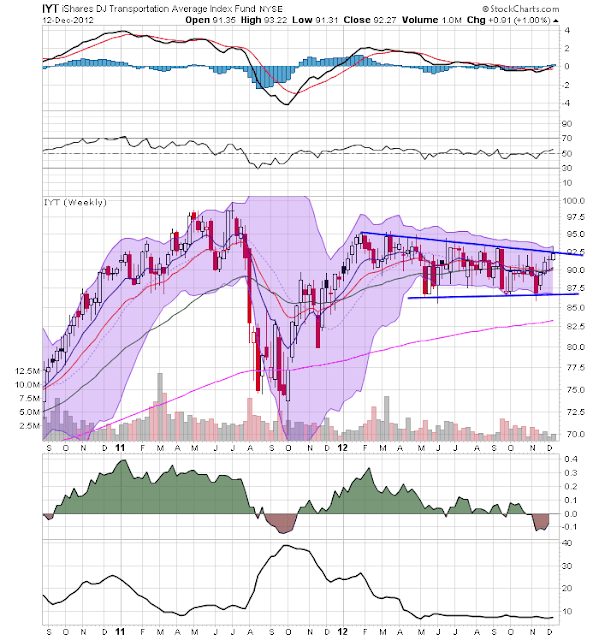 The Brazilian market's weekly chart still shows that the market is near multi-year lows. 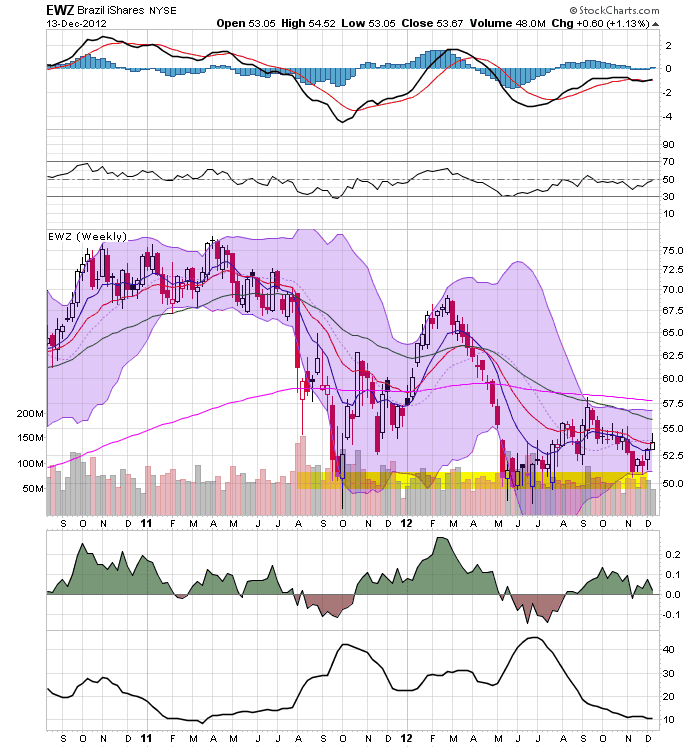 Prices are below the 200 day EMA, and the shorter EMAs are below the 200 as well. 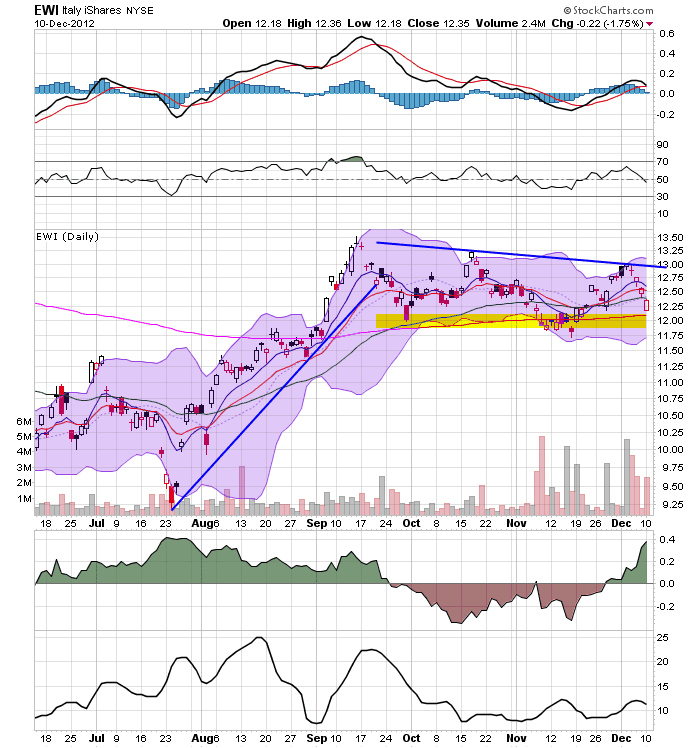 Momentum is weak, and the CMF is barely positive. The Russian market's ETF is still trading in a range between 24 and 32 -- a range that has existed for nearly a year. The Indian ETF is still trading in a range between the 47.5 area and 62.5. However, momentum is rising and the CMF shows an influx of money. 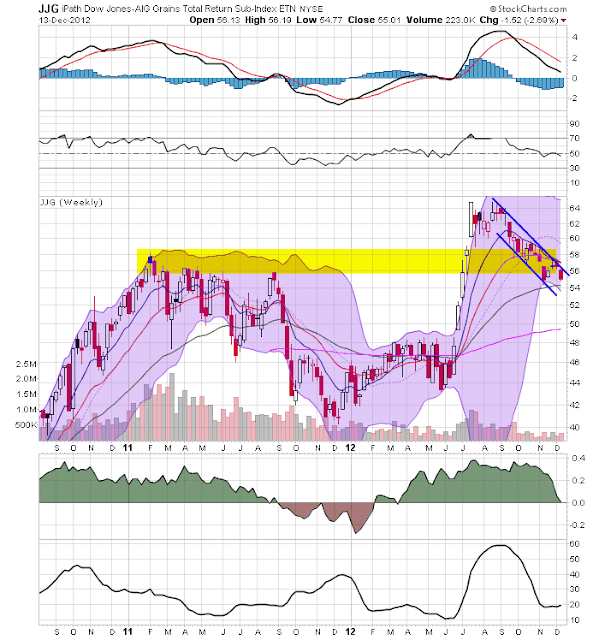 They key to this chart will be if prices can continue above the 200 day EMA, which has provided upside resistance the entire year. After spiking earlier this year due to massive drought conditions, the grains complex has been heading lower for the summer and fall. Right now, prices are right at the 50 week EMA. On the daily chart, notice that prices have been moving lower in a very disciplined manner for the last three and a half months. Prices are right at the 200 day EMA, with a stabilized MACD. However, we see a slightly positive CMF. With respect to the "fiscal cliff", ... no deal means that the long-run finances of the U.S. government are automatically rebalanced and the tax system becomes more progressive--major wins--at the cost of some risk of a small recession in 2013--a significant loss, but not an overwhelming one given the long-run stakes. The source for DeLong's "small recession" remark is this study [pdf] by the Congressional Budget Office showing that the tax hikes and automatic spending cuts making up the "fiscal cliff" will cause the U.S. economy to contract at an annual rate of 1.3% for the first half of 2013, and the unemplpoyemtn rate would rise to about 91%. However, economic growth would resume in the second half of the year to 2.3%. In order to avoid this mild recession lasting 1/2 a year, we are told that Social Security and Medicare must sustaain permanent cuts that won't address the underlying problem of soaring medical costs at all, but will cut real benefits to older Americans who have paid into the system for their entire lives by 20% or even more, forever. In other words, we are being told that we have to go over the second cataract in order to avoid going over the first one. The choice is pretty obvious. For the record, the Northwest Plan by Bruce Webb and Dale Coberly shows that the shortfall in Social Security benefits several decades from now can be entirely cured by an increase of a few tenths of a percent in the payroll withholding tax. Medicare is actually much more efficient than private medical insurance. The problem with Medicare is soaring medical costs, not the aging of the Boomers. Was the Fed Statement Really That Momentous? To support continued progress toward maximum employment and price stability, the Committee expects that a highly accommodative stance of monetary policy will remain appropriate for a considerable time after the asset purchase program ends and the economic recovery strengthens. In particular, the Committee decided to keep the target range for the federal funds rate at 0 to 1/4 percent and currently anticipates that this exceptionally low range for the federal funds rate will be appropriate at least as long as the unemployment rate remains above 6-1/2 percent, inflation between one and two years ahead is projected to be no more than a half percentage point above the Committee’s 2 percent longer-run goal, and longer-term inflation expectations continue to be well anchored. So, the Fed won't move on rates until unemployment is below 6.5% or the inflation rate is above 2.5%. Is this really a momentous decision? It is in the sense that the Fed is issuing hard targets -- they're tying the rate decision to unemployment and they have given themselves a good escape hatch in regards to inflation (which, given their dual mandate, was required). This does create a certain level of certainty for the markets, which some have argued is vitally important for an economy trying to emerge from a debt-deflation recession. However, does anyone out there think the Fed was going to raise rates anytime soon? The Fed -- and literally every other "first world" central bank (Japan, UK, ECB, etc...) has rates at very low levels to combat sluggish economies, has had rates at those low levels for a number of years and has given us no signs that they intend to raise rates soon. I don't know anyone in their right mind who has been watching the overall economic performance over the last few years (and especially the last few months) who thinks rates are going up. And I think you could make a convincing argument that the only people making that argument are people who are trying to come with ideas for columns rather then reasonably analyzing the economic landscape. Given the underlying data, I think this is more of a situation confirming what the market already thought -- that the ultra-low rate environment is here for a really long time -- rather than being anything revolutionary. Earlier this week I calculated what initial jobless claims were likely to have been ex-Sandy. I can now calculate that number for the week ending December 1. NY and NJ together were 60,888 of a total of 500,931, or 12.6% of the total of non-seasonally adjusted claims, which after seasonal adjustment were revised to 372,000. A year ago NY and NJ constituted 91.2% of all claims in the same week. Backing them out and calculating the total jobless claims number had the remaining 48 states constituted 90.7% (compared with October of this year) or 91.2% (compared with a year ago) of total claims gives us estimates of 360,000 and 358,000 respectively. That makes the best estimate for what initial jobless claims would have been one week ago had Sandy not occurred, 359,000. The 4 week average would have been 372,000. While I can't calculate this week's number, assuming the effects of Sandy have dissipated, today's report of 343,000 would lower the 4 week moving average to 362,000, a new post-recession low. No recession has ever begun within 2 1/2 months of a new low in initial jobless claims. Unless we find out that there was a special "issue" with today's number, this, along with the likely new post-recession high in real retail sales for November also reported this morning, is strong evidence that while the economy is shambling along, it is not actually in recession. All section so the US treasury curve -- save the long end (bottom chart) -- are trading at or near highs of near 6-month long trading ranges. This tells us that traders are still concerned about the economy and are keeping the risk on trade going full steam. 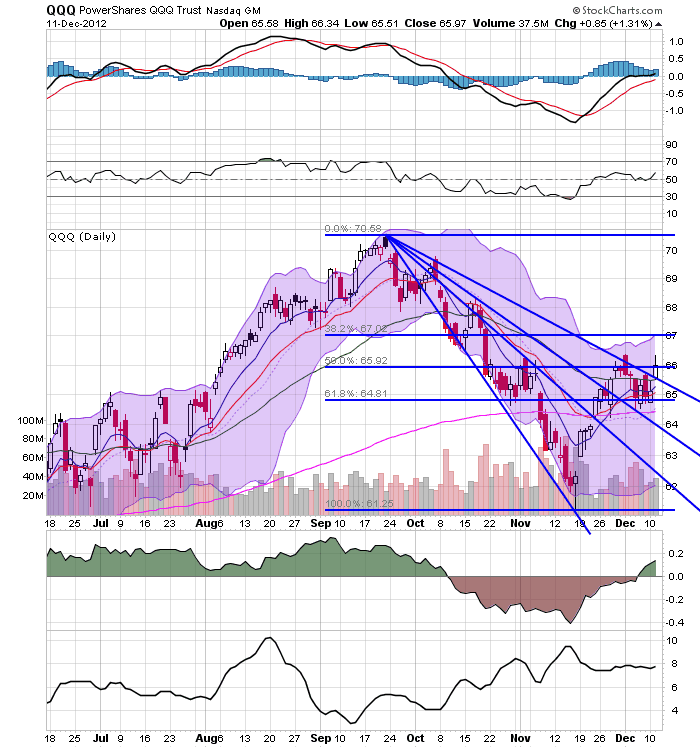 The transports are in a very interesting, longer-term technical situation. 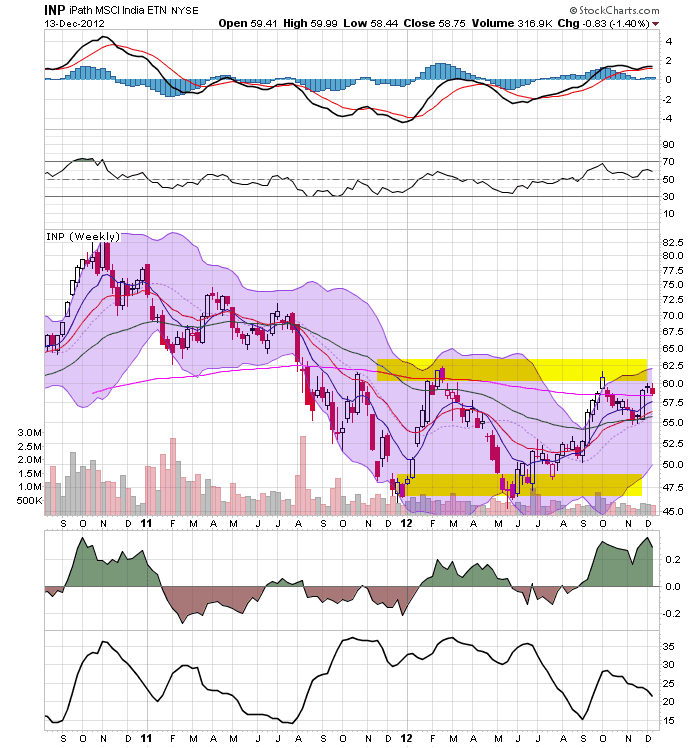 For most of this year, they have been trading in a very tight range. 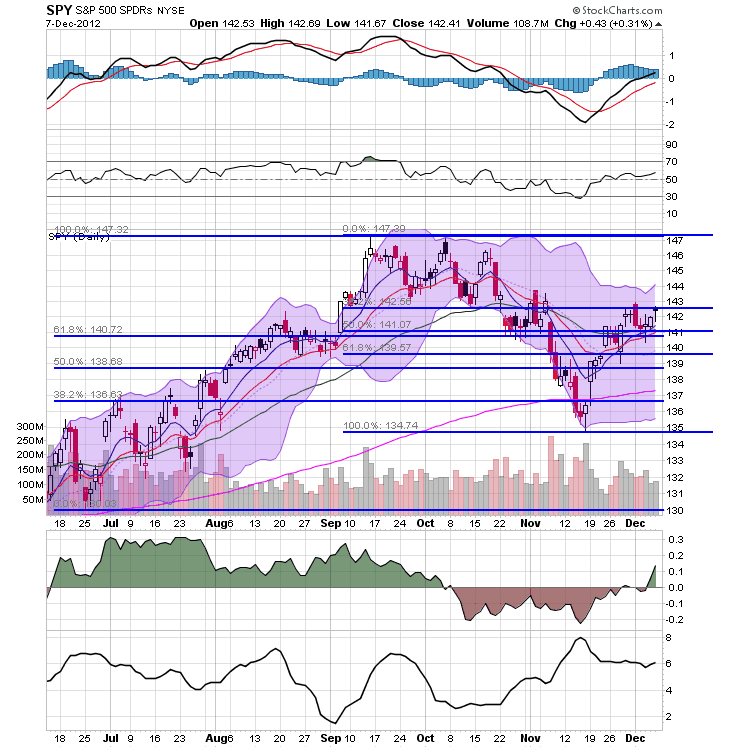 While the markets were rallying earlier this year, this lack of advance was concerning. 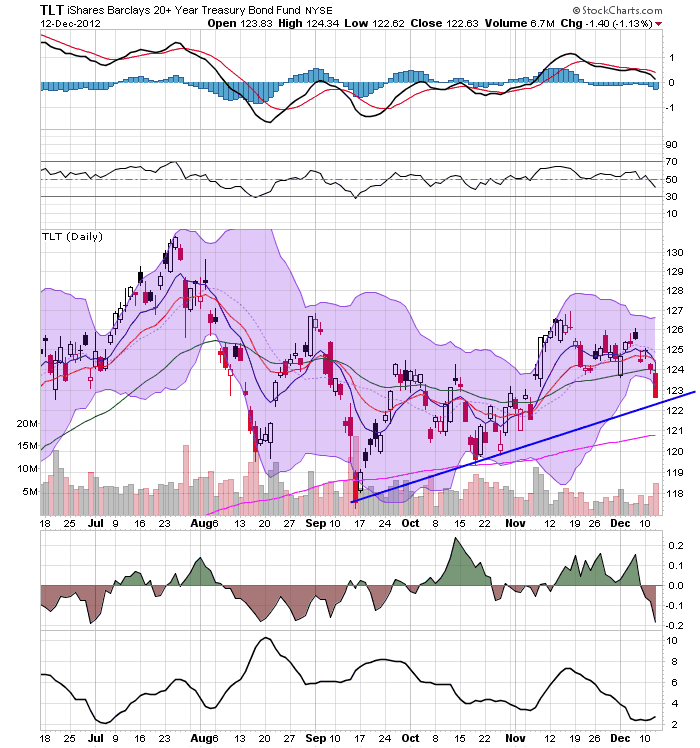 However, now that the markets are in a weaker technical position, the fact the transports are holding their own is somewhat comforting, indicating that traders are aren't in the mood to sell the market as sharply as recent action would lead one to think. And while we're on the topic of trading ranges, gold is also in a near year-long trading range as well. Although as indicated the relationship is somewhat noisy, the real personal savings rate appears to lead real GDP by 6 to 18 months. I haven't looked at this relationship in over a year, and that's a shame because it's one long leading indicator which actually supports ECRI's recession call, albeit just barely, and just for a brief period of time. Notice that the real personal savings rate declines by at least 5% in advance of every recession, with the decline frequently beginning at least 2 years before the start of the next recession, and usually reaching the 5% mark beofre the recession's onset, or at least early into the recession. Furthermore, the indicator appears to have no false positives, i.e., every time the real personal savings rate has declined 5% or more, a recession has occurred. Finally, in all but two of those occasions, the real personal savings rate turned negative, at least briefly. Fundamentally, the indicator makes intuitive sense. It is essentially an objective manifestation of consumer sentiment -- that is, how much of a savings cushion over the inflation rate do consumers feel comfortable with? When they become much less comfortable, as manifested by their savings rate, their spending contracts and a recession begins. Once they feel that they have an cushion of savings and can spend more again, the economy expands. Notice that the dip into negative territory was very brief. 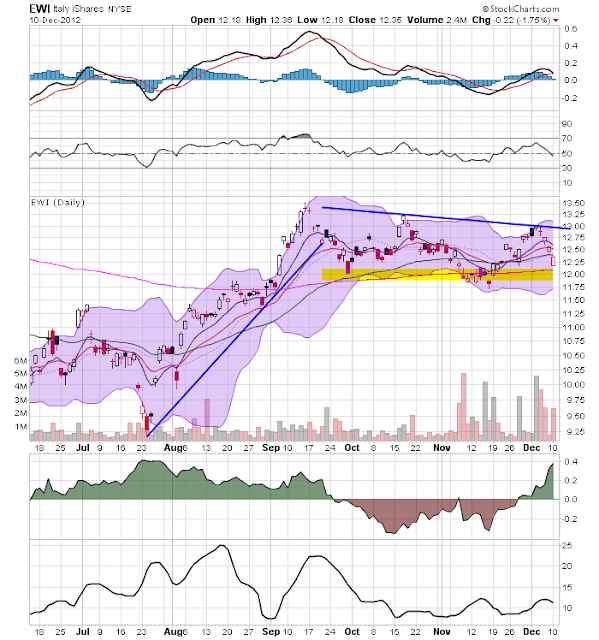 The indicator has been positive all this year. In the past, when the indicator, having signalled recession, then turns positive, it has generally meant that the recession is within 6 to 12 months of ending. 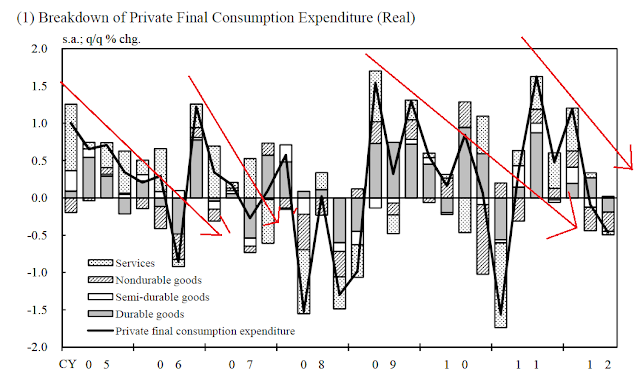 In other words, even if the real personal savings rate suggested that a recession was likely to begin this year, it also suggests that any such recession should be ending right about now. No one indicator is infallible of course. It is nevertheless interesting that this indicator was first tripped at the end of 2010 when ECRI said their long leading index started to decline, and turned negative when ECRI went on record as saying that a recession (then called to begin by the end of 2011) was inevitable. My own version of ECRI's Long Leading Index turned positive in early 2011. I know of at least one other variant that closely matches the Long Leading Index which turned positive later in 2011. If the long leading indicators are positive, that could be one reason ECRI hasn't mentioned them at all in any of their public communications for at least the last nine months. 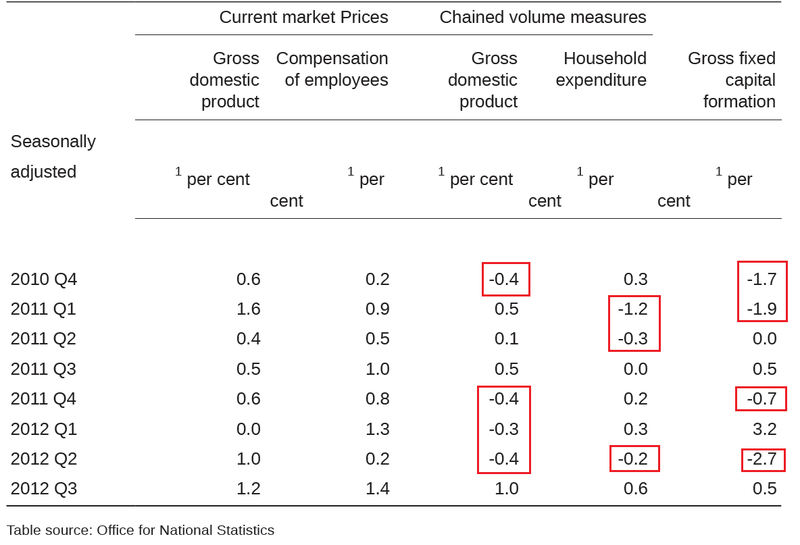 One final note: even though the real personal savings rate is positive, it is very weakly so. It's just shambling along in a living dead sort of way. The UK economy has barely grown over the past two years, as it has laboured against the consequences of the financial crisis and its impact on global demand, a sharp squeeze in domestic spending power and a necessary fiscal consolidation. The period of weak demand has been accompanied by stagnant productivity, raising questions about the extent to which the supply capacity of the economy has expanded. Increases in energy and other import prices and in VAT have meant that CPI inflation has been well above its 2% target for much of this period. There is simply so good news in that paragraph. The economy is at a standstill, demand is weak, productivity is stagnant and prices are at uncomfortable levels, preventing the central bank from doing anything else. 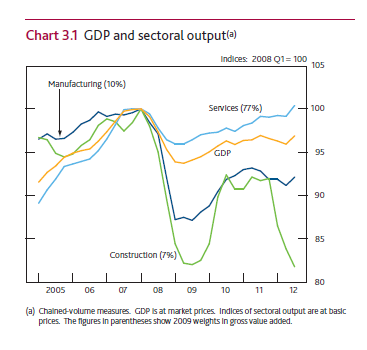 UK GDP has contracted in 4 of the last 8 quarters. Household spending has contracted in three of the last 8 quarters, and has barely grown in four of the remaining five quarters. Gross capital formation has been negative in four of the last 8 months. 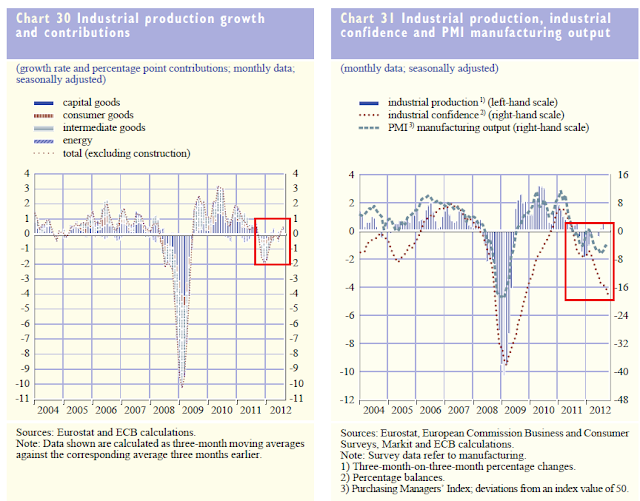 The two charts above break the economy down into manufacturing and service sectors. Manufacturing either contracted or didn't grow in four of the last six quarters. We did see a nice bump in the last quarter. 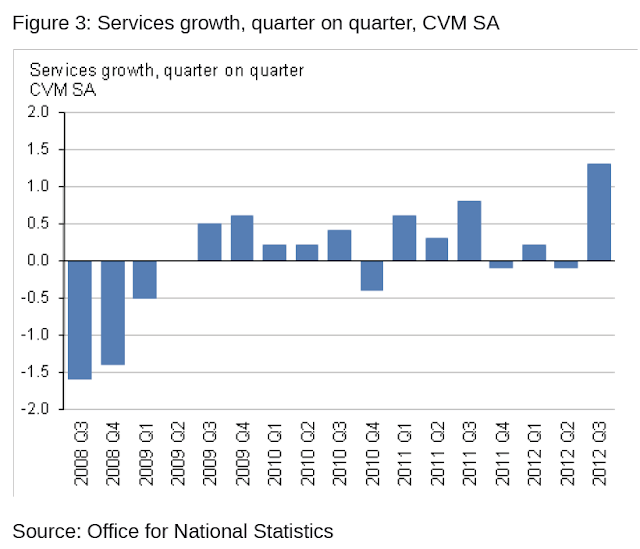 Service sector growth is a bit better. In 4Q11-2Q12 the sector contracted, which is to be expected considering the economy was in a recession. The sector did see a nice bump last quarter. The second estimate of GDP for the third quarter of 2012 was unrevised from the previously published 1.0 per cent increase in the preliminary estimate of GDP, despite small revisions within the production and service industries. Downward revisions of 0.1 percentage points to manufacturing and construction were offset by a 0.6 percentage point upward revision to mining & quarrying including oil & gas extraction. Despite these revisions the picture remains broadly unchanged, with output indicators suggesting weak growth bolstered by special factors such as the Olympic and Paralympic Games. 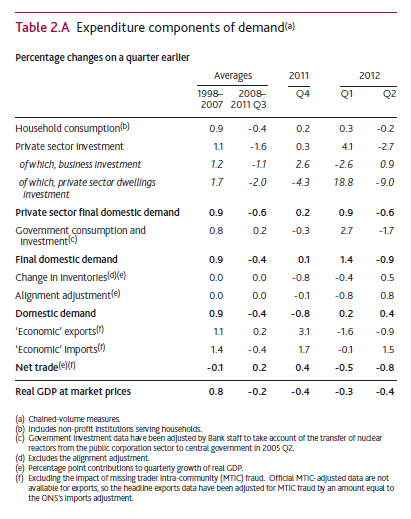 The above chart shows various GDP components and compares their post recession performance to their performance over the 1998-2008 time period. The results are devastatingly negative. 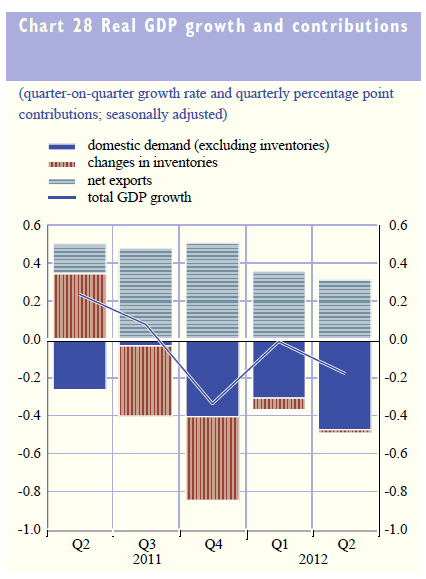 Previously, household consumption increased .9% Q/Q, but is now contracting .4% Q/Q. 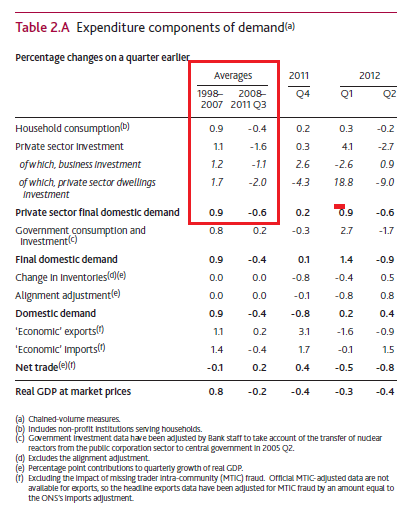 Private sector investment was increasing 1.1%, now it's decreasing 1.6%. Private sector final demand was increasing .9% Q/Q now its decreasing .6% Q/Q. Simply put, these are terrible numbers. Household consumption has been consistent since the Great Recession -- but there is no improvement. The good news to this is that savings has increased, but right now the economy needs spending. 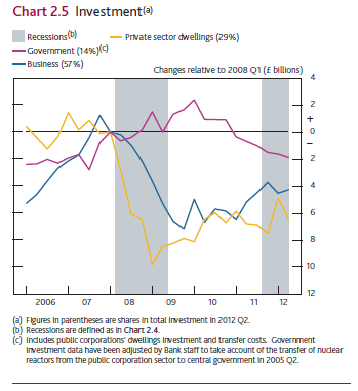 And the chart above shows that overall investment -- government, business and private sector dwellings -- are all far below pre-recession levels. Put simply, the UK economy is in terrible shape. It hasn't meaningfully grown since 2008. And, their plan of austerity is clearly hurting their efforts to move beyond. The semiconductor sector has been consolidating in a symmetrical triangle pattern for most of the year. 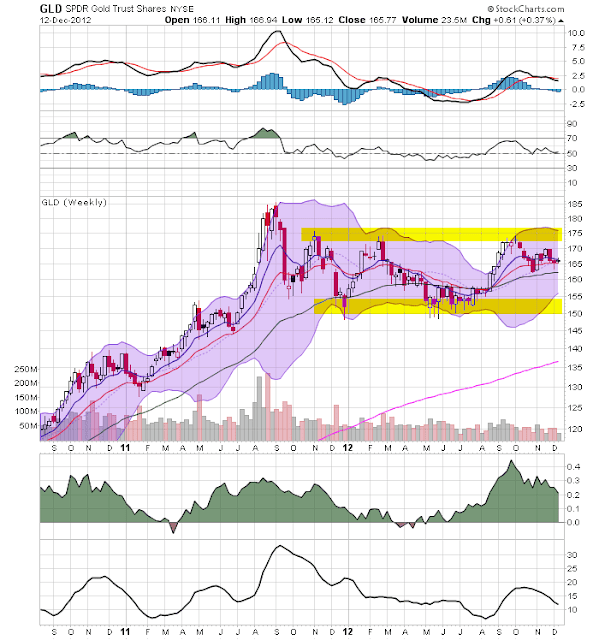 However, this week, prices have broken through upside resistance on a buy signal from the weekly MACD. 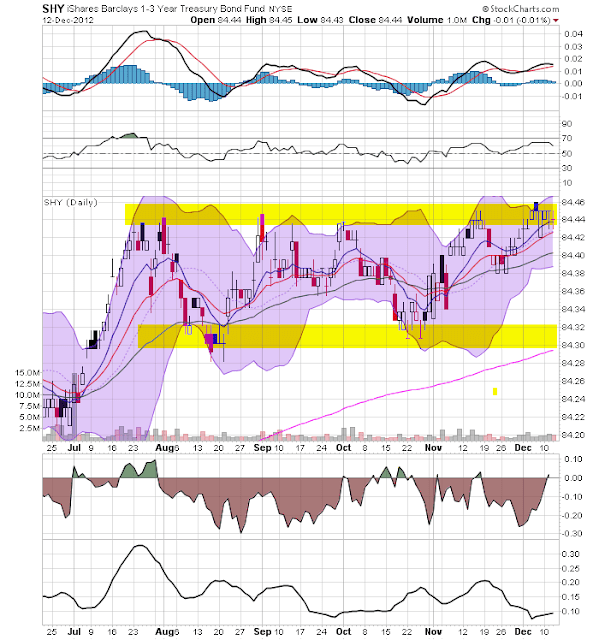 The good news in this char is semis are a decent leading indicator for trading. The daily SMH chart shows that prices have broken downside resistance in late November. 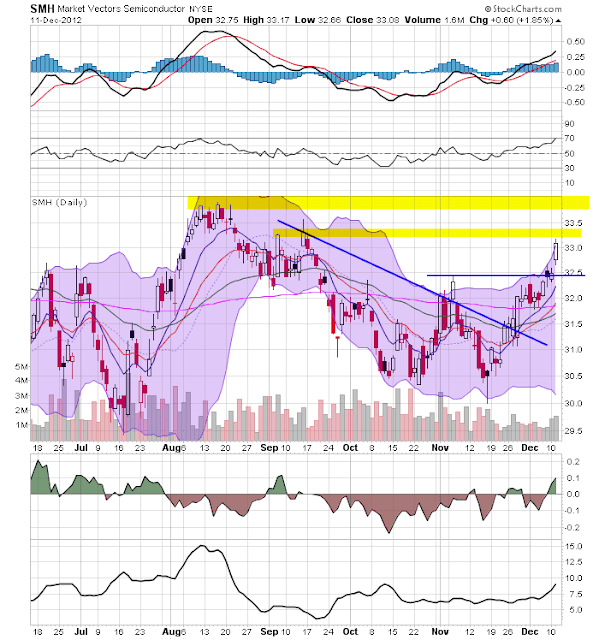 Prices have been rising since than, moving through the 200 day EMA and trading above all the EMAs. Also note the rising MACD. The chart shows upside resistance about 33.25 and 33.75. 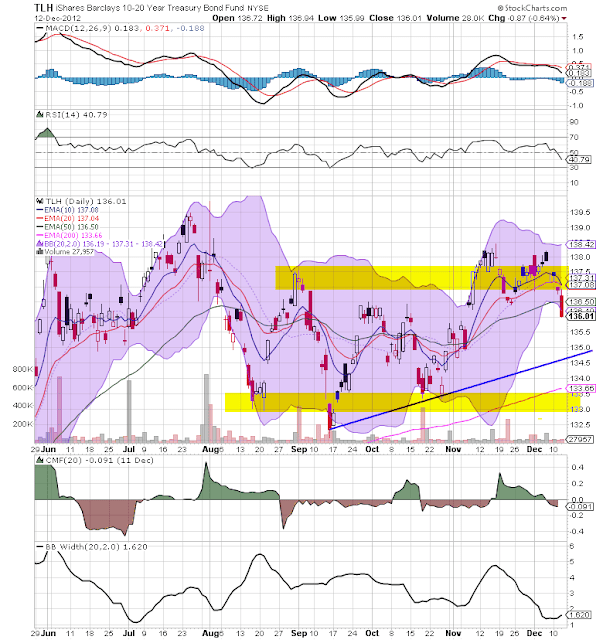 The daily chart of the QQQs puts recent market action into perspective. First, we see the 13% drop from late September to mid-November. Since then, prices have rebounded to the 50% level from the sell-off. Now, prices are above the 200 day EMA as are the shorter EMAs. 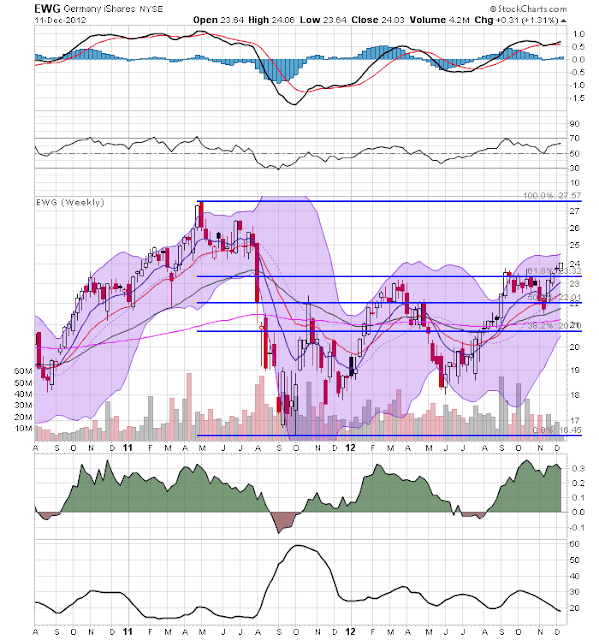 The weekly German market chart shows that prices have moved above the 61.8% Fibonacci level -- an area that has provided upside resistance for most of the year. Notice the especially strong CMF reading, indicating money is moving into the market. German, being a safe haven country in Europe, should be absorbing safety flows. 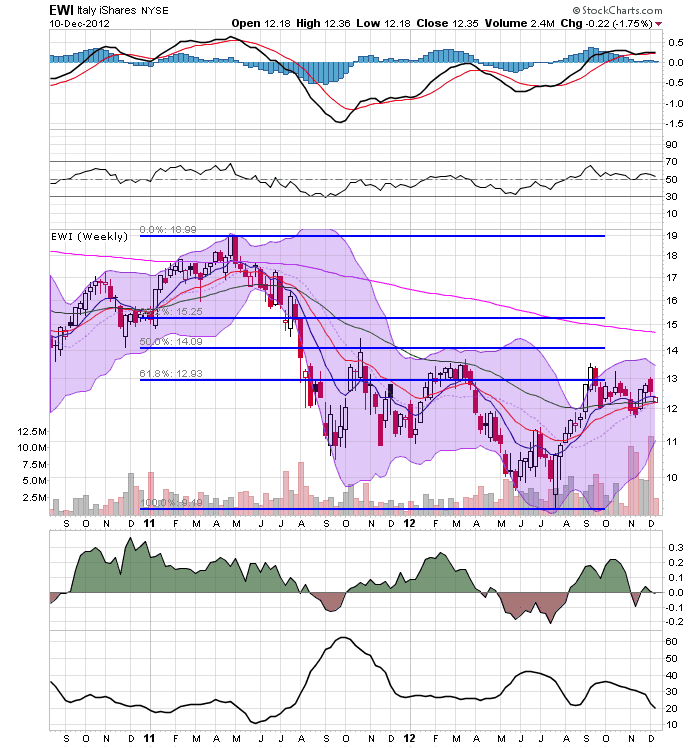 The weekly emerging market ETF is still trading between the 21/22 and 27/28 area. Vodafone’s entry into the fast-growing market was well-timed and profitable. In 2007, it paid $11.2 billion for a two-thirds stake in Hutchison Essar. Now its mobile subscribers in India have increased more than fourfold to 127 million. But then came the tax bill: Indian officials slapped the company with a $2.5 billion capital gains charge for the purchase, and alarm bells started ringing. It was an interpretation of the country’s tax law without precedent, an attempt to raise money on a transaction that took place outside India, and even more controversially taxing the buyer rather than the seller, a Chinese firm. Since then, the government has opened retroactive tax investigations into hundreds of other deals involving foreign companies. I can tell you from a professional point of view, that the tax aspects of this deal were analyzed well in advance of the deal being done. That's just the way these deals work. I can also tell you that this decision came as a huge shock to those involved. It's simply not possible to do any meaningful business in this type of environment. But according to Western business leaders and diplomats, one problem stood out above all others: the sheer unpredictability of doing business in India. First things first: last Thursday I wrote a post that turned out to include an erroneous claim about the latest initial jobless claims report; namely, that ex-Sandy, last week's number would have been 339,000. Unfortunately, I had compared a week-ending 11/27 apple with a week-ending 12/04 orange. I won't know until this Thursday what last week's number would have been ex-Sandy. Fortunately, the New York Times didn't run this information on their front page. My colleague Jeff Miller, however, did mention it in his Sunday column. So I apologize to Jeff and to you. Everybody makes mistakes and while I can't promise not to make mistakes again, I can promise that if I make a mistake and find out about it, I'll let you know. That being said, what I decided to do after Thursday's column was to go back and look at all of the weeks after Sandy, and run two control groups - one consisting of the four weeks before Sandy, and the other of weekly YoY comparisons. If, for example, typically the other 48 states outside of NJ and NY include 90% of all jobless claims, but in week X after Snady, they only included 80% of all claims, converting the week X figure to a 90% weighting of nonseasonally adjusted claims ought to give us a good estimate ex-Sandy. Tnen all we need to do is use the seasonal adjustment and we have a very good seasonally adjusted ex-Sandy number as well. It turns out that, regardless of whether I use a month over month or YoY comparison for the control, the numbers are quite close. In the first chart below, I give the % of all claims that the other 48 states outside of NJ and NY constituted for each post-Sandy week, plus the four weeks before Sandy, and also YoY from the equivalent weeks last November. In the 4 weeks just before Sandy, the 48 states besides NJ and NY were responsible for 90.7% on average of all claims. One year before, they were responisble on average for 91.1% of all claims. In the second table below, I've taken the raw jobless claims total for the 48 states ex- NJ and NY, and figured what the total 50 state nonseasonally adjusted number would be if the % of total claims were 90.7% or 91.1% instead of the actual post-Sandy percent. Then I've mutlipled by the seasonal adjustment for each week. As you can see, the results are very close. Finally, I averaged the two results for a final estimate that is probably within 1000 or so of what the actual number each week in November of this year would have been had Sandy not occurred. The final column to the right, in bold, is the final estimate for what initial jobless claims would have been in November without Sandy. Had Sandy not occurred, it appears the 4 week average of initial claims would have risen slightly during November compared with October. I'll update this with new information so long as it appears Sandy is having and effect on the claims number. Considering the news out of Italy yesterday, let's start with the Italian market. The weekly chart (top chart) places the overall situation in macro-perspective. After selling off from 19 to 10 over a year-long period, prices have since rebounded to key Fib levels, where they have remained. 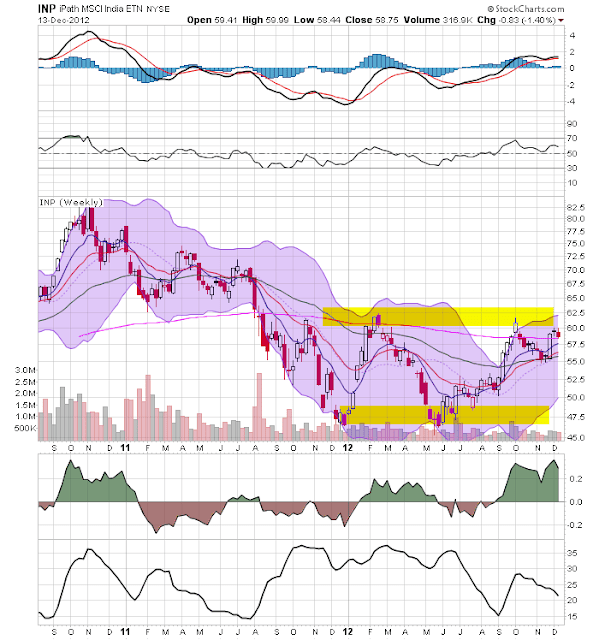 The daily chart (bottom chart) shows that prices rallied starting in the end of July to mid-September, where they have been consolidating sideways since. Notice how prices are using the 200 day EMA as technical support on this chart. 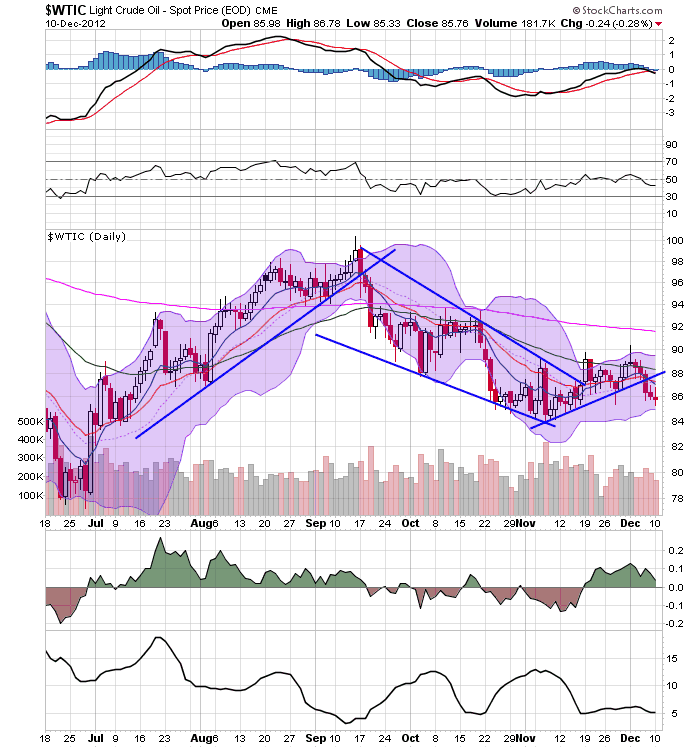 After breaking a rally in mid-September, oil sold off in a disciplined, downward sloping channel. PRices broke this trend in mid-November, but have had a difficult time rallying, finding resistance at the 50 day EMA. So long as prices are below the 200 day EMA, and the world economies in general are slowing, it's difficult seeing this market maintaining any momentum, outside of a major geopolitical event. 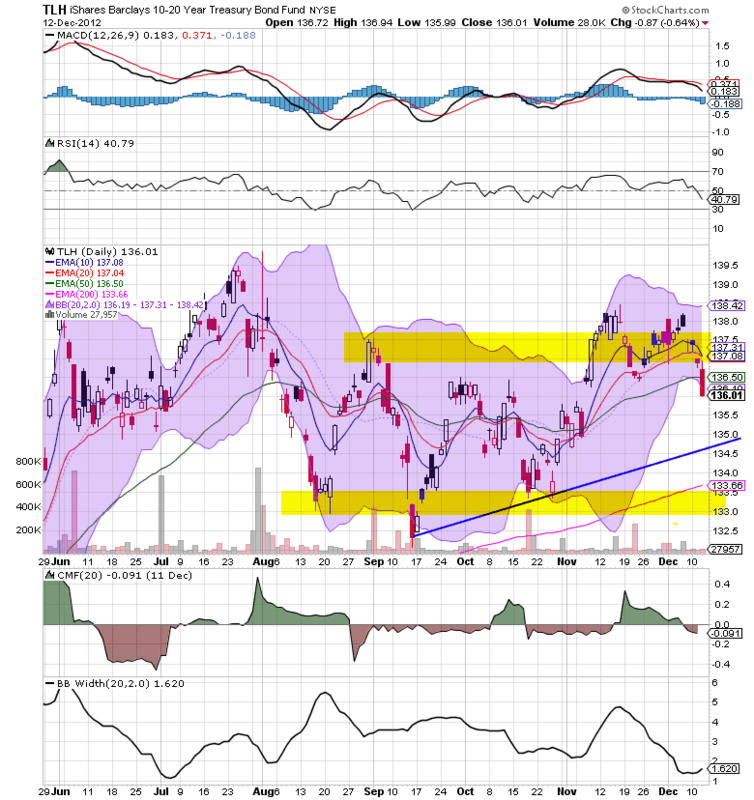 After breaking support at the 122 level, the yen has solidified its losses in a consolidation between 118.5 and 120 for the last few weeks. 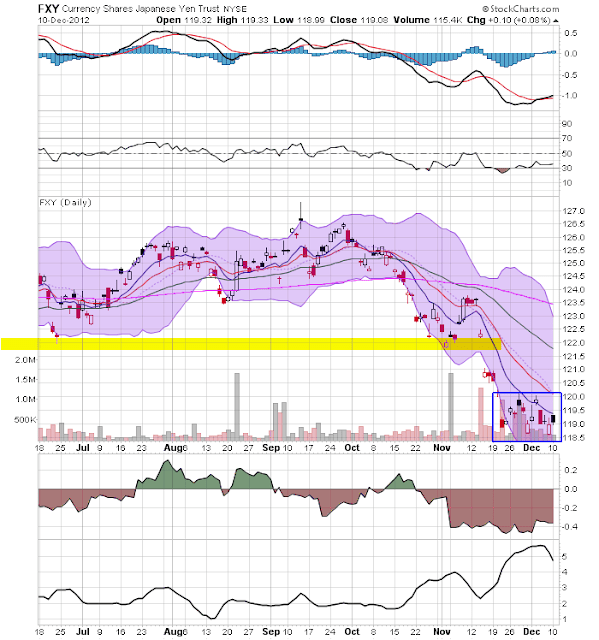 The buy-signal from the MACD indicates that a counter-rally wouldn't be surprising here, with an upside price target of 122. (The above is from a Japanese zombie walk). When I was in college (late 1980s) a wave of anti-Japanese sentiment swept the US. Japanese industry was far more efficient and effective than its US counterparts, and the coordination between Japanese government and industry was the hallmark of public private coordination. 20 years later, Japan is still trying to come out of its malaise with no hope in sight of a meaningful recovery. 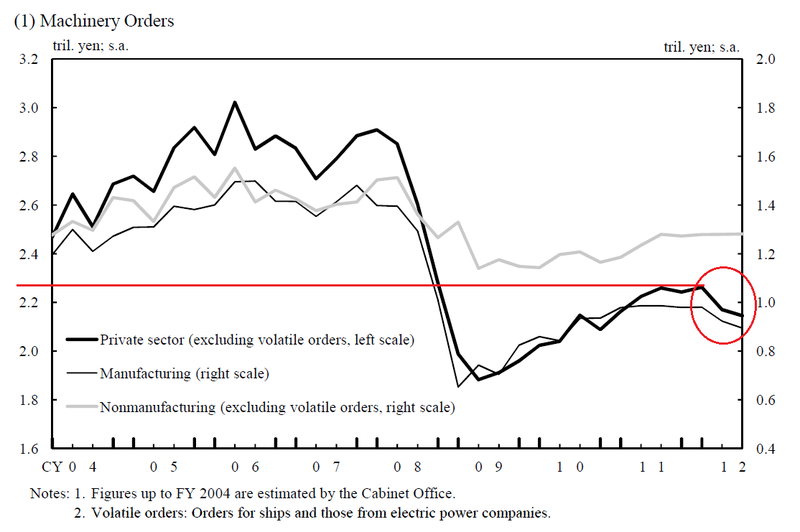 All of charts below are from the Bank of Japan. The chart above shows Japan's quarter to quarter GDP percentage change. Without including the great recession, Japan has had at least six episodes of slow growth over the last nine years. While they have been able to lurch forward (see 2Q05, 1Q07, 4Q07, 2Q09, 3Q11) for short periods, there is no momentum to their growth. In fact, this chart looks very much like a "two steps forward, one step back) economic scenario. 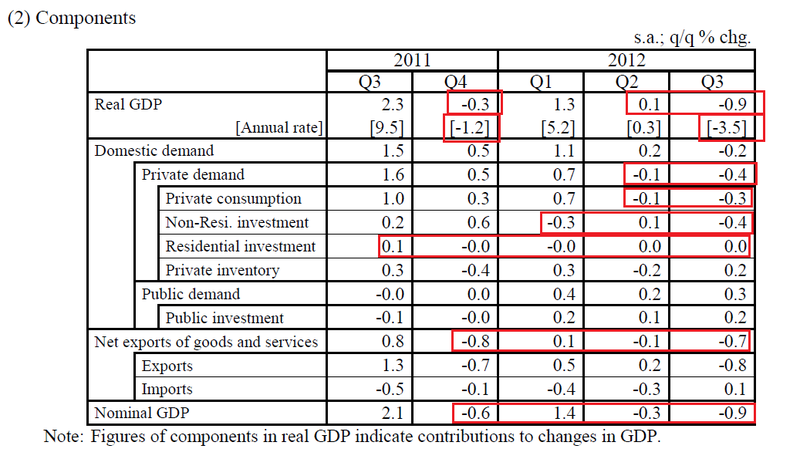 The above chart simply puts numbers to gross real GDP and its components for the last 5 quarters. In three of the last five quarters, we've had either marginal growth (.1% in 2Q12) or negative Q/Q growth (4Q11 and 3Q12). Private demand has been terrible. Residential investment has been slow for 5 straight quarters. Private consumption has dropped for the latest 2 quarters and non-residential investment has either been negative or only growth lightly in the last three quarters. The real problem for Japan has been the negative export picture. In three of the last four quarters, exports have contracted, while in only one have we seen an increase -- and then only a moderate one. This chart is perhaps the scariest that Japan faces. Since their peak in 2008, net exports have seen a steady decline. A healthy trade surplus is Japan's only ability to finance it's mammoth debt/GDP ratio (which currently stands at over 200% of GDP). 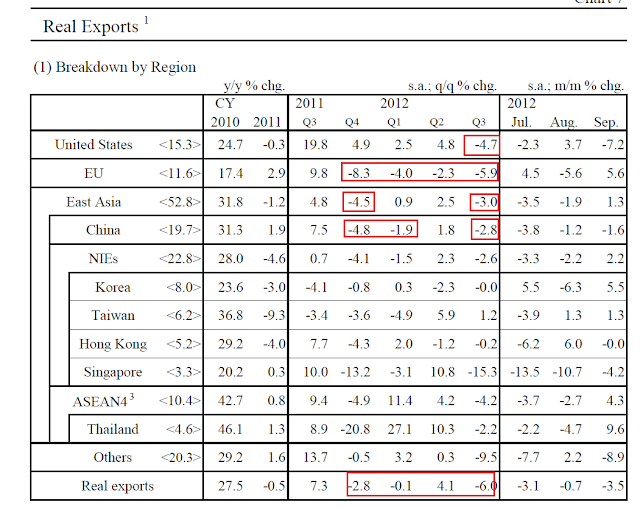 Total real exports are at the bottom of the page and they show that three of the last four quarters have seen a negative quarter to quarter percentage change. EU exports have contracted for the last year; Chinese exports have contracted in three of the last four quarters and overall exports to East Asia are down in two of the last four quarters. 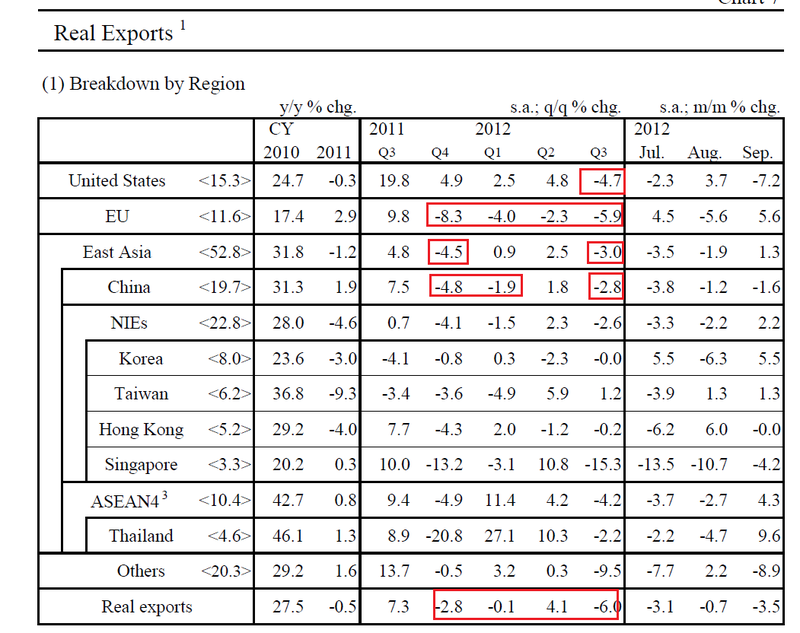 Even exports to the US dropped last quarter. 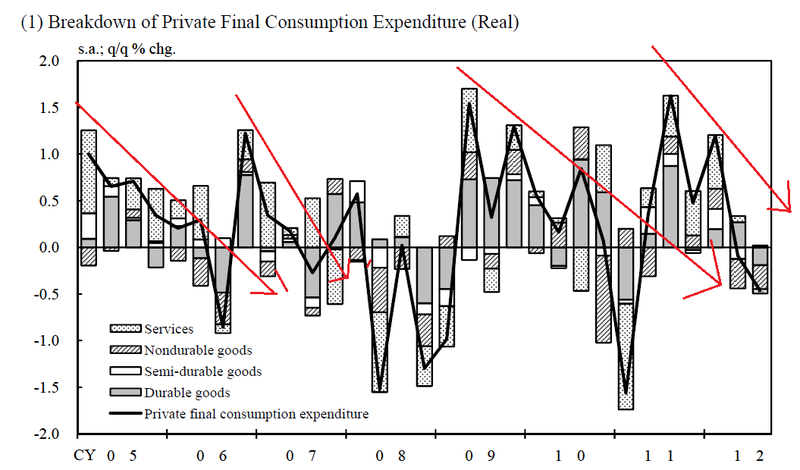 Above is a chart of the quarter to quarter percentage change in personal consumption expenditures. Notice that we see peaks (1Q05, 4Q06, 2Q09 and 4Q11) followed by continued moves lower. PCEs -- like GDP above -- are unable to maintain upward momentum growth. Instead, we see a quarter of growth followed by downward movement. 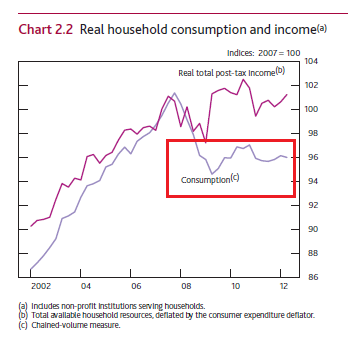 The above chart shows total household spending (top line, left hand scale) going back to 2004. Notice the line is moving horizontally, indicating a lack of advancement in overall spending. 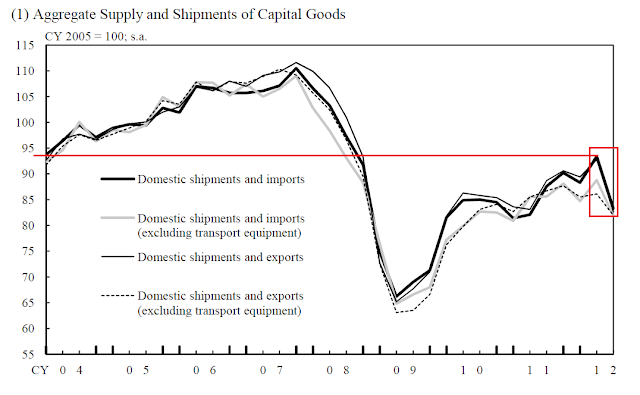 The top chart shows total domestic shipments and imports of capital goods. This number is still below pre-recession levels and has taken a sharp downturn over the last two quarters. 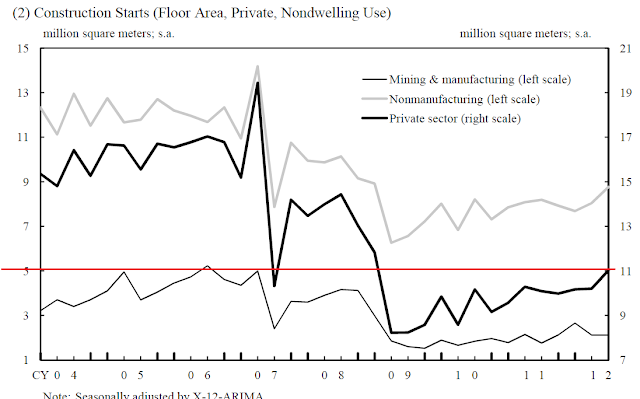 The middle chart shows that total private machinery orders are still far lower than pre-recession levels, while the bottom chart shows shows the same situation in the private sector construction areas. There is nothing hopeful in any of the above charts; no data point that signals a possible growth spurt ahead. Perhaps most terrifying is the slowdown of the Japanese export sector. Without a positive trade balance, Japan will have continued problems financing its debt.